"As the country with the world's second-longest coastline, Indonesia has yet to bank on its rich marine resources to support the growing number of superyacht visitors to Indonesia", shares Richard Lofthouse of Asia Pacific Superyachts Bali and Raja Ampat in Indonesia. This is changing, notes Lofthouse, as exemplified by reports from the Indonesian government about marina expansion of its vast seas. Most superyachts are attracted to the country's spectacular islands and the abundance of natural beauty unchanged for thousands of years. Now the government has some excellent plans, some already in effect, to ease yacht visitors' arrival and departure. President Joko Widodo has announced that Indonesia will build up to 10 ports in a push for maritime tourism, including cruise ship ports and marinas. "When the cruise terminal in Benoa is finished in August, people will no longer have to go to Singapore," he said. "That way, if a cruise ship goes to Benoa, it will be able to proceed". Coordinating Maritime Affairs Minister Luhut Binsar Pandjaitan said he also pinned his hopes on the cruise ship terminal in Benoa, Bali, to be managed by state-owned port operator Pelindo III. The terminal, estimated to cost 1.7 trillion rupiahs, is intended to accommodate big ships at least of a 13-metre draft. Its construction is scheduled to be finished in August next year. Pelindo III corporate secretary Faruq Hidayat confirmed that the firm had begun to dredge the cruise terminal and would finish the work before the IMF-World Bank meeting in Bali in October next year. "Indonesian tourism is dominated by cultural attractions, which draw more than half of the foreign visitors to the country, followed by nature", said Tourism Minister Arief Yahya, according to the Jakarta Post /Asia News Network in late October 2017. The minister pointed to other potential maritime tourism activities the government sought to develop, such as yachting, cruising and diving. He highlighted the Raja Ampat Islands in West Papua, which are home to the planet's most diverse fish and coral resources and have been named by CNN among "the world's best diving sites". 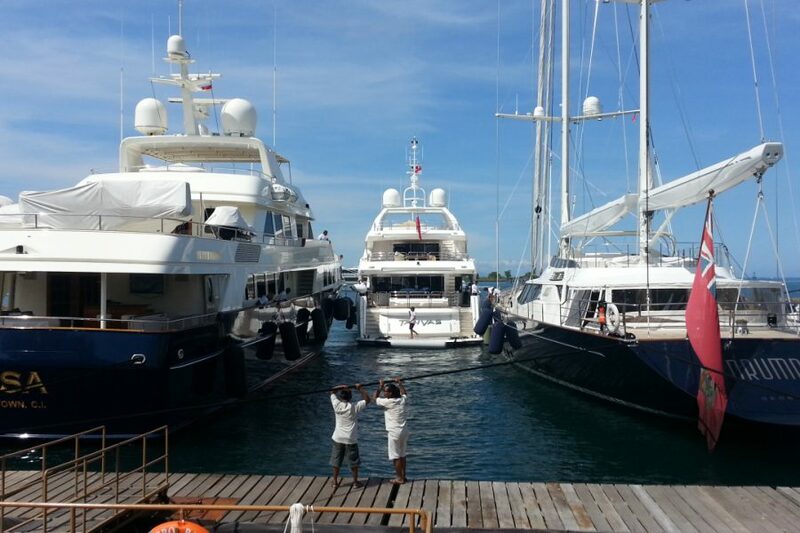 Supporting visiting yachts and fitting in well is Asia Pacific Superyachts Indonesia new branch office in Raja Ampat. The name translated means, "The Four Kings", a name derived from the four major islands in the group nestled on the tip of Papuas Birds Head peninsula in Raja Ampat. A Raja Ampat cruising journey takes a vessel through one of the world’s most exceptional marine areas and stunning sea and land scenes. Renowned for its biodiversity, Raja Ampat encompasses over 40,000 square kilometres in the northeast seas of the Indonesian Archipelago where the Pacific becomes the Indian Ocean. Diving is a popular activity amongst yachting visitors and the ministry has identified another 10 top diving sites it banks on for tourism, such as Bunaken in North Sulawesi, Derawan in East Kalimantan and Labuan Bajo in East Nusa Tenggara (NTT). "The Tourism Ministry plans to improve infrastructure and provide regulatory support to develop tourism and yachting in these areas", notes the Tourism Minister, adding to the area's many attractions. Lofthouse notes, "Indonesia has so far simplified rules on yacht arrivals by waiving clearance approval for Indonesia territory (CAIT), which cuts the time for issuing entrance permits from three weeks to just three hours. It has also conditionally scrapped the cabotage principle by allowing passengers of foreign cruise ships to embark and disembark at five major Indonesian ports. We look forward to welcoming more yachts in 2018 in Bali and at the APS branch in Raja Ampat".